Странная штука я пробовал валить его соло в мишке обвес - как у бомжа, он меня почти убил в последний момент доброе пати орды меня добило, и грохнуло его, и таки да квест засчитался! Что это баг или фича? В связи с большим наплывом желающих эксплорить зоны Катаклизма. Близы зделали так что даже 1 удара по мобу достаточно для выполнения многих квестов, но это касается исключительно новых зон. Рес НИПа моментальный.стоит его убить тут же появляется другой. Великан Проблим ходит по часовой стрелке - поэтому искать его удобнее, бегая против часовой стрелки. Level 85 Elite, 387k health. Spawns at the northwest corner of the circular path going around Baradin Hold and patrols clockwise. Fairly easy to solo as he's subject to snares and stuns, but his Log Smash ability hit me (in Bear Form) for about 17k each time, so avoid that. Scratch what I said earlier about him patrolling clockwise on the path; I just saw him walking counterclockwise after the last battle. Unlike Tank, the shark in Tol Barad Peninsula, this one is immune to fear, so warlocks beware. He does have less health than Tank, though. Spawned at 31,45 for me, right after killing him in that spot. Also, his patrol seems to alternate clockwise/counter, though the pat direction could be linked to different spawn points. Not immune to Slow, so Arcane Mages can happily kite him along with the other "usual" tactics. Popping Mirrors, Time Warp and other cooldowns can easily get him down to about 25-50% health (in green/blue quest gear), and since he'll be so busy chewing on your mirrors you'll have plenty of stand and shoot time. Just make sure to Blink out of Log Smash. Can be slowed, snared, rooted, stunned. If you can do any of these and deal damage from range, have fun soloing this "group" quest. As well, soloable as a shadowpriest. DoT him up, heal yourself, run away from Log Smash. Mind blast when you get an orb, reapply DoTs, it's an easy win. You can also drop Shadowfiend+Fade if you're having trouble outhealing, gets you 15 seconds of relief to either nuke or heal. From the comments here, I'm guessing this quest is no problim to be solo-ed. He has been changed in a recent server patch and is now immune to crowd control as is the shark so you may want to bring a tank, or be one. Even though this is classed as a group quest you probably won't need a group to do it since the other players there will probably join in and nuke him anyway when they see you scrapping with him. Or at least most on my realm do, myself included as you gain credit for the quest by simply being on his threat list so you don't have to be in the same group as the player who tags him. Just soloed him again this morning as I do every morning, but this time he wasn't CC:able, immune to stuns, and roots, but not slows. Almost died since I prefer to open in catform with a charge, pounce, free ravage, rake etc and then rip, and into bearform before pounce stun ends, but this time pounce resulted in "immune" and he bonked me hard before I got into bearform, got hit by log once in my confusion before I gathered myself and hit all my tanking cooldowns to try and turtle the fight, worked, just avoid log and if you need to heal while he's casting it. Stealth buffed it seems, or was my problim unique? Indeed, he was hotfixed and is now immune to stuns, roots and disarms. He is now immune to Curse of Exhaustion. No longer soloable. Immune to stuns, slows, disarms/dismantles. I got him down to 50k as a heroic geared rogue and then died a lagdeath. I really hope nobody makes the mistake of soloing him like I did, they must have hotfixed him or something. Omg! Poor ram on his back! He doesn't seem to be leashed. I was able to kite him all the way from near the Slagworks to the bridge to Tol Barad Peninsula before he went down, on the one day I couldn't find anybody else who wanted to help kill him. Haven't tried kiting him across the bridge yet. It's not necessary to be in a party to get credit for killing him, or even to get a share of the loot. However, he despawns within seconds and respawns within a few more seconds, so even if you're a melee class it's a good idea to pull him a bit away from any of his spawn points. Easily soloable as an Enhance shaman. I was wandering around cause Alliance having TB on my server is rare so I never did the dailies before. Stumbled into him saw he was an elite with a lotta HP. Immediately popped wolves JC trink Shamanistic rage and hero. Didn't have to move outta log smash. Just absorbed the damage. Dropped him and I still had over 80k/100k hp left. Use your cooldowns religiously - DP from the get go (or you can time it for that first Log Smash). Avenging Wrath + Seal of Truth to start off damage, he'll go down pretty steadily. I was mitigating most of his melee swings and would occasionally WoG myself back some health. You can save your Holy Power for SoR if you have Shield of Duty spec'd for extra damage... I used my LoH when Problim went down to about 120K. Spawns at the northwest corner of the circular path going around Baradin Hold and patrols clockwise. Problim's does not spawn at the same place all of the time. His spawn point is always near the active minidungeon (the area that hosts the set of three dailies that keep changing). For example, if you currently have the quests for the Cursed Depths active, which are The Imprisoned Archmage, Learning From The Past, and Clearing the Depths, Problim will spawn on the east side of Tol Barad, right behind the Cursed Depths. Just be careful as you solo him that you're not near an entrance. He respawned on me almost as soon as his previous corpse hit the ground, and me with 17k health... ROCKET BELT GOOOOOOOO! 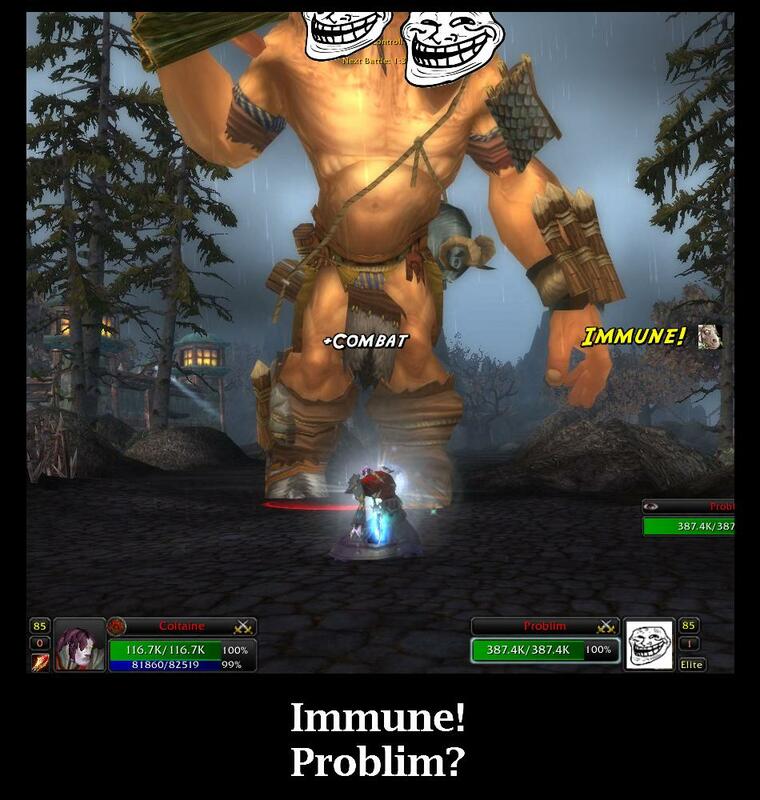 Horde looses TB ...... problim Garrosh? If you're not part of the solution, you're part of the Problim. A not so obvious refference to Troll Face, (as i havent seen a singel comment) where hte quest A Huge Problem, reference to the saying "Problem _______?" and the monster it self is a huge troll, which well, troll, you get it. Also i dont know if the name is suppossed to be another refference, as he might say about the spelling "Problem Dictionary?". Was able to solo as enhance shammy today using wolves and bloodlust only. Just drop totems, attack Problim, pop wolves and use their taunt, pop bloodlust and stay out of smash. Keep using wolf taunt everytime he turns to you. Easy fight. That's no ram, that's a Louis Muitton bag! There's a lot of, "easy solo for x class" type posts in here I've noticed but as is the way with these things it depends on the attacking characters gear level more than anything else as to whether / how easily he and Tank can be done solo. If you are a freshly dinged 85 in greens and < ilevel 333 blues then Problim is going to be a handful for some classes and probably not possible for others, whereas Tank will be really difficult for some and impossible for others. Once you get your cataclysmicly superior achievement and start getting your first few epics, Problim will be easy for some classes to solo and a pain for others and Tank will be fairly easy for some classes but still a massive pain for others. So if you need to kill one and no one else is around, make sure you have reasonably good gear if you don't want a difficult fight. Actually managed to solo him on first try as an Arms Warrior. I was herp derp most of time and even took 2 Log Smashes and walked away with 1k health and a Group Daily completed solo. Though I got to take credit to a trick my friend taught me, popping Commanding shout before hand, and when at half way health, used Rallying Cry and then Enraged Regeneration, so that 36% of my health was more of a heal than I usually would get, due to crazy increase in health. Soloed on my lvl 86 Pandaren Brewmaster. Soloed as a Blood DK, incredibly easy if you just keep up Death Strike and avoid his Log Smashes. I do have the cape from the Thrall questline, the boots, neck and ring from Molten Front, and full Bloodthirsty Pyrium (Excluding boots of course). Any person who has decent gear should have no problem taking him down. His worst ability is to constantly hide from me. I'm disappointed this guy's not a troll. Is he really sposed to be that hard! I've never had trouble with him. I solo'd him quite easy on an 85 Blood DK (specced for more mainstream DPS/PvP not tanking BTW). Don't even need to use Deathstrike, but do anyway as it's a very main ability. At 373 item level now, though when I first killed problim solo I was at 348 or 356, and it was stlll not a 'problim' Anyway, I've not tried to tackle him as any other class, but I will say he's no sweat on my Blood DK. He dropped an Intellect Enchant for Bracers for me. Super easy to solo. Prot warrior in DPS gear w/1H+Shield. He managed to cast 2 log smashes and I didn't even have to move out of them. Im 386 ilvl in my "Prot DPS" set though, but I guess any warrior can do it, at lower gear level you'd proberly just have to pop shieldwall+last stand+enraged regen. Tactic? Um I don't know. Shield block > Shield Slam > Revenge > Devastate > Heroic Strike (60+ rage). He lumbered by while I was farming for Savage Leather and I couldn't find anyone to help kill him so I decided to try and solo him. Killed him pretty easy as a 85 Hunter, ilvl 362. Thought it would be fun to try and kite Problim across the bridge and to Hellscream's Grasp. I was right! Mindlessly doing dailies when this guy dropped a LvL 84 rare BoE mace! Was pretty excited when I started reading the tool-tip. But before I could even finish reading and click the item to loot it, the corpse (along with my item) vanished! Please for save yourself the trouble and just auto-loot this mob, because the corpse despawns within 30 seconds of dying. In case you're having trouble finding him since people are no longer killing him at spawn, he walks slowly, clockwise around the path. Этот NPC может быть найден в следующих зонах: Тол Барад (136).